The Pacific ADA Center offers a variety of information such as webinars, podcasts and publications for emergency preparedness. Do you or your caregiver have a plan in the event of a disaster? We care about everyone's safety. 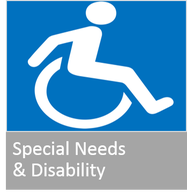 For those who have special needs, please review this site for important information in preparing for emergencies. This particular guide will also assist you with additional tips on surviving a disaster.